Paul: Here we are again, marshalling a whole host of new Games News arrivals! Please stand back as I wave the latest Games News to Gate F26, where it will disembark and make its way toward customs. 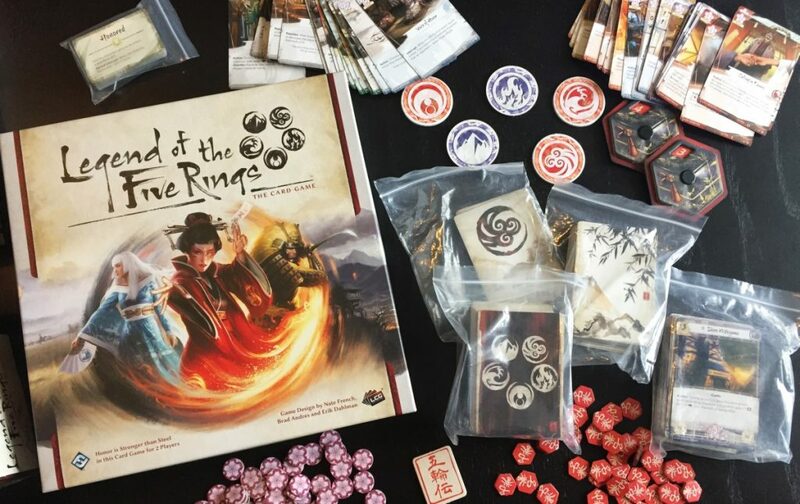 Quintin, I believe you actually wanted to detain a particularly important story related to Fantasy Flight’s new Legend of the Five Rings card game, right? Fantasy Flight are now on a schedule of launching a new “Living Card Game” every year, and every so often they’re mind-blowingly good. 2012’s Android: Netrunner took over my life, the 2015 reboot of the Game of Thrones card game was very strong, and 2016’s Arkham Horror: The Card Game has captured the hearts (and brains, and souls) of both myself and all of my card-playing friends. 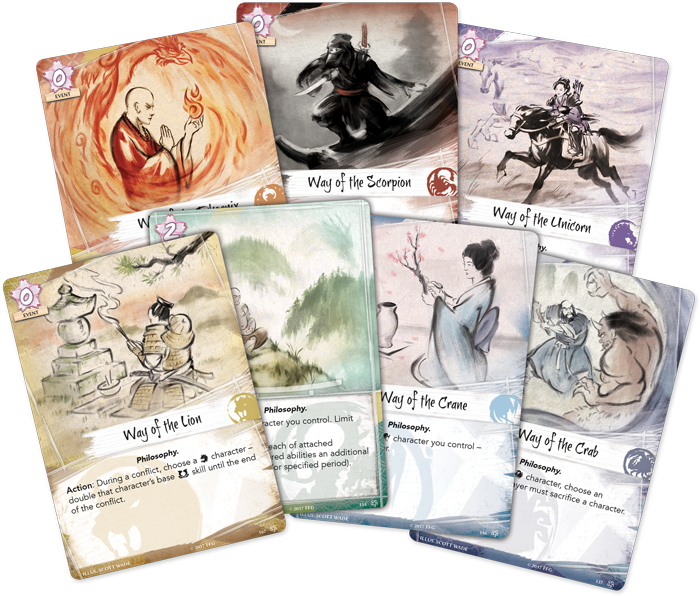 This year’s entry, the new Legend of the Five Rings card game, doesn’t just look gorgeous. It looks interesting. And I don’t say that lightly! I’m not going to explain the game here, the above two links do a lovely job of that. Instead, I’ll say that there are a few mechanics which I really like the sound of. The need to place “Fate” on units to decide how long they’ll stick around for sounds like a teasingly unsolveable puzzle, since the more fate you put on a unit the more seductive a target it’ll be for your opponent. I also like the sound of the blind bidding, multiple victory conditions and hidden information in the form of province cards. Namely, all the stuff that lets players actually play, as opposed to acting as steely scientists who simply buy cards and design decks. Could L5R be my next obsession? Maybe, maybe not. But I will say that I’m always in the market for a new obsession, and that Fantasy Flight’s LCG team seems to be going from strength to strength. The instant this game arrives it’ll be placed at the top, the very precipice of my review stack. 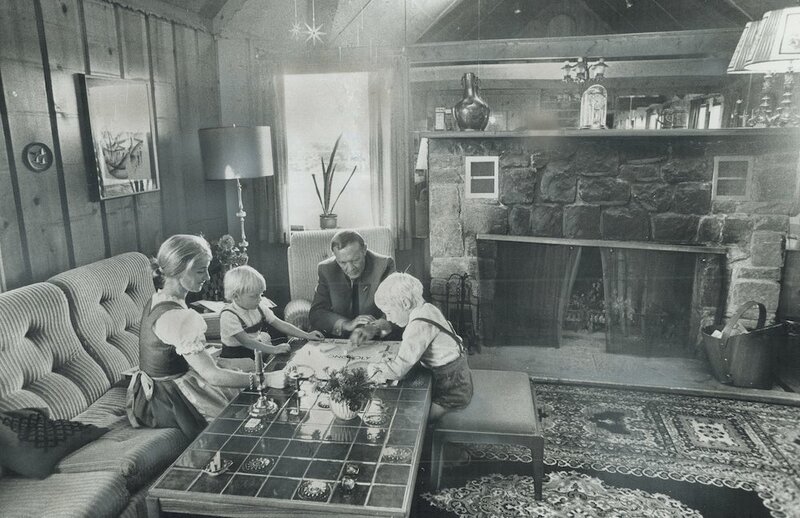 Paul: After it came in from the Czech Republic, I pulled aside this story about Czech Games Edition’s latest prototype, a party game with the working title That’s a Question! (exclamation mark included). It features three-sectioned cards covered parts of questions that are linked together to form a query which everyone else has to guess your answer to. Do you prefer bears or Meat Loaf? Would you rather be able to hug a bear or hug Meat Loaf? And so on. Probably. There’s a brief example of a round of play in this preview video, though I’m not immediately convinced by how exciting this might be. I think it will all lie in just how good those question fragments are. Quinns: Paul! 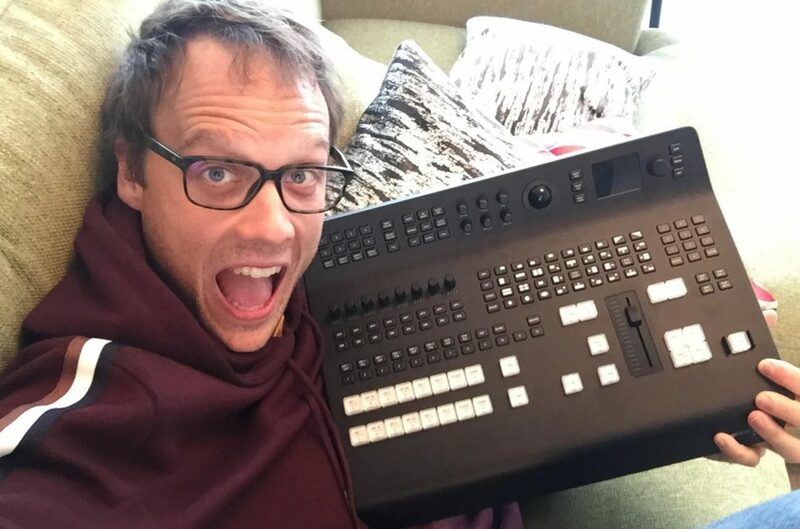 Hold that story for… further questions! Ahaha! Actually, I really like this announcement. CGE have probably sold more copies of Codenames than all of their other games put together, so of course they were going to try and continue that mass market success. So while I’m sad that we’re not getting another niche, complicated Vlaada game, I’m thrilled that Vlaada will be bringing his joy and genius to more people than ever before. As it should be! Release this story from detention, Paul. It’s free to go on its way. Quinns: On a more serious note, our department received a tip-off today about Flamme Rouge, which Matt and I wholeheartedly recommended in this video. In a hilarious first, the designer of Flamme Rouge has communicated exclusive news to us in the form of a lackadaisical tweet. If any other designers or publishers would like to tweet exclusive news at us, I’d love to make this a thing. Quinns: Yes! I’m beyond excited. I love Flamme Rouge, I just wish I could buy an expansion to make it a shade more complex. Soon I’ll be able to do just that, with rules for five and six players, supply zones, cobblestones and, yep, a twelve player variant is should cycle its way to us be here by Essen in October. Wonderful! And apparently the minds behind the game have ideas for expansions “for years to come”. That’s convenient, because I’ll want to be buying expansions for Flamme Rouge for years to come. I could have sworn one of our commenters joked about an expansion for Flamme Rouge that would add cobblestones, but I can’t find it now. Hmm. Paul: Are you searching the luggage for Kickstarters? Quinns: Absolutely, and I’ve found something to declare! 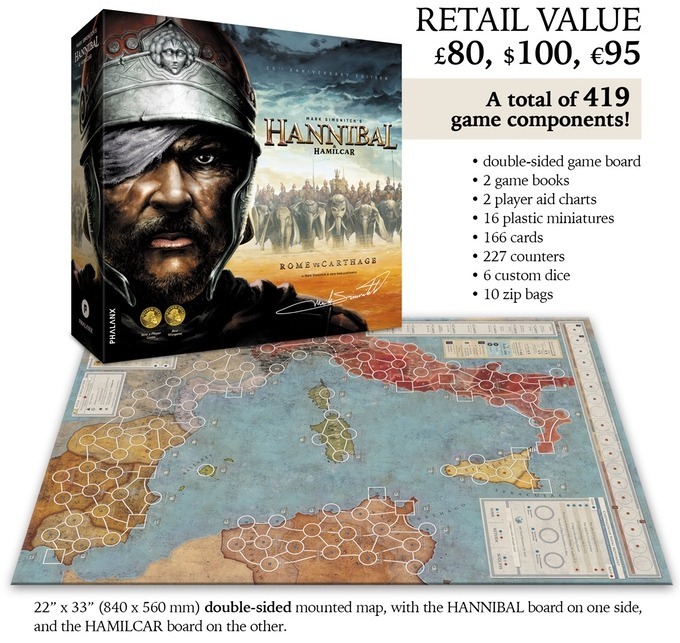 First released in 1996, Hannibal: Rome Vs. Carthage is still sitting pretty as Board Game Geek’s 107th highest-rated game of all time, and this month saw the launch of a Kickstarter for an updated, beautiful new edition titled Hannibal and Hamilcar. Why the name change? Because contained in this new box will be two games. You get not just the classic game of Hannibal, but also a “companion game” titled Hamilcar that adds all a brand-new naval system. That this new edition will be “Easier, faster, shorter and better” is music to my ears, and there are miniatures now, too, but don’t let that fool you. Apparently this is a deeply political game, with actual battles acting as a last resort. What’ve you found over there, Paul? Is that alcohol? Someone should’ve declared that. Paul: Oh my goodness SO MUCH WHISKY. Obviously I have a nose for ANYTHING SCOTTISH and could not resist seizing Clans of Caledonia. 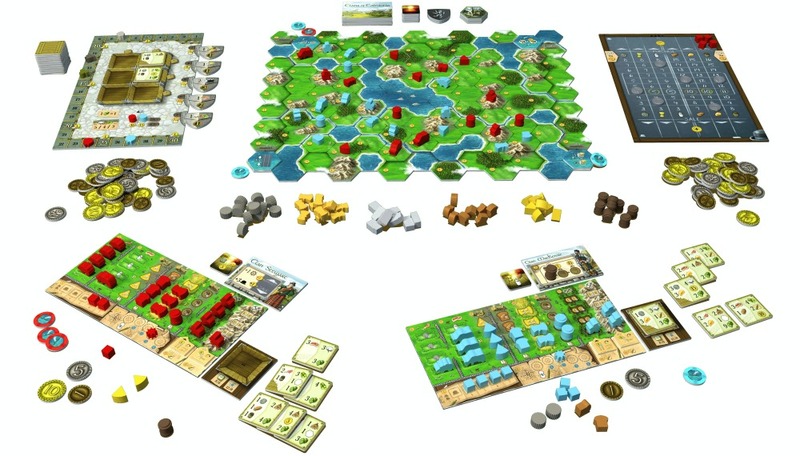 YES I KNOW it’s a little twee, but it’s immediately taking me back to some of my favourite modern board gaming memories of ten years ago, of collecting resources and breeding animals and making goods to trade, all featuring generous amounts of wood and cardboard, as well as a MODULAR SCOTLAND that you can endlessly rearrange. I’d love to endlessly rearrange Scotland. You could line up all the castles next to each other. Or think of all the places you could put Dundee. Paul: QUINNS I FOUND SOME DRUGS. Quinns: Oh, that’s fine. That’s just the recent story about getting people on ecstasy to play trust games. You know how that is, right? You get them to play the Prisoner’s Dilemma and discover that, actually, they’re friendly and more inclined to be cooperative, but at the same time their judgement doesn’t seem to waver and they still won’t trust people who seem untrustworthy. But mostly I like this article because it led my friend to imagine playing The Resistance on ecstasy, which is an amazing mental image. Oh god, what are the sniffer dogs going crazy over now? Paul: Oh, just a My Little Pony version of Scythe, that’s all. You know. The usual. Our extra special thanks to Shirley Naught for passing the news of this absolutely brilliant game on to us. Quinns: I must have it. What are some things that you must have this week, readers? SU&SD's New Twitch Streaming Starts Thursday!